Stainless Steel fittings are ideal for outdoor use as stainless steel does not stain, corrode, or rust as easily as ordinary steel. Stainless Steel is particularly suited to garden design projects, marine and boating. Stainless Steel gives increased reliability and durability with minimum maintenance. 4mm Stainless Steel Quick Link M4 Quick Link with internal dimensions of 32mm x 12mm. AISI 316 stainless steel construction. Often used as a connecting link for rope or chain. 6mm Stainless Steel Quick Link M6 Quick Link with internal dimensions of 45mm x 14mm. AISI 316 stainless steel construction. Often used as a connecting link for rope or chain. 8mm Stainless Steel Quick Link M8 Quick Link with internal dimensions of 58mm x 18mm. AISI 316 stainless steel construction. Often used as a connecting link for rope or chain. 5mm Stainless Steel Dee Shackle M5 dee shackle with internal dimensions of 19mm x 10mm. AISI 316 stainless steel construction. Often used as a connecting link for rope or chain. 6mm Stainless Steel Dee Shackle M6 dee shackle with internal dimensions of 25mm x 13mm. AISI 316 stainless steel construction. Often used as a connecting link for rope or chain. 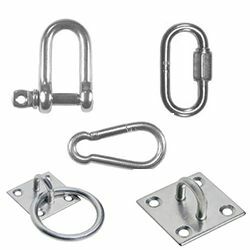 8mm Stainless Steel Dee Shackle M8 dee shackle with internal dimensions of 30mm x 16mm. AISI 316 stainless steel construction. Often used as a connecting link for rope or chain. 8mm Stainless Steel Welded Ring. Inside diameter 50mm.